Suncoast car rentals provides a great range of quality cheap vehicles for your holiday, we take the hassle out of renting a car and provide great service. Our Gold Coast Airport car hire service operates out of the actual airport so you actually can pick up and drop off your vehicle at the airport any time of the day or night, no need to catch a shuttle bus back to an office to get the car. great convenience after you have got off a long flight just to be able to get the car right away. You can visit some great places on the coast, why not drive down to the nearest theme parks, wildlife parks, fantastic restaurants and bars. Adding to the local tourist attractions are the lively and colourful markets along the Gold Coast. Our car hire Gold Coast offers unlimited kilometres, damage cover options and more that will absolutely bring you anywhere in the City at affordable rates. Suncoast's car rental gold coast Airport service is a great start for people looking for surfing at golden beaches, sunny weather, inviting rainforests and sightseeing down on the oceanfront. If that's not all, you can also take memorable 'dinner-cruises' on some of the best luxury yachts available. 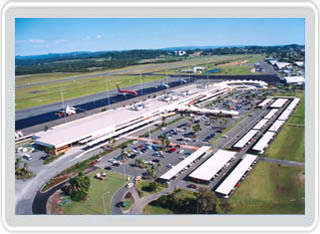 Coolangatta airport has recently been renamed to Gold Coast Airport, this took place in 1999. Gold Coast airport is approximately eighty kilometers from Brisbane and is currently listed as Australia's fastest growing airport. Renting a car from car hire Brisbane will also give you a quick travel to explore the Gold Coast. A new infrastructure is taking place connecting directly to the airport allowing even greater accessibility. Car rental Gold Coast Airport has never been easier thanks to the fac that it acts largely as a holiday based airport allowing easy access to theme parks, the gold coast and surfers paradise. With the Suncoast Car Rentals Car Hire Gold Coast Airport service, choose from a wide range of hire cars or you can request for a car hire Surfers Paradise to visit the majestic beaches of Queensland- vans, sports cars, luxurious sedans, 4WDs and compact cars and drive down to the area's popular picnic spots. This sunny side of Australia is blessed with over 300 warm sunshine days in a year; allowing you to make the most of your Gold Coast trip. Great roads and great cheap Car Hire Gold Coast Airport options allow you to make the most of drives along secluded beaches and exploring the town. Open 7 days, Suncoast Car Rentals Car Hire Gold Coast Airport service offers convenient car pickups at the Gold Coast airport and other popular locations. Our business has been around since 1985 servicing the Gold Coast and brisbane area for over 25 years. Our low cost budget rental cars come with accessories like baby seats and boosters' seats for the kids and sat navigational units for the adults. Mind you wont be long before the kids will be using your electronic equipment. Cut Price Car Rentals also offers cheap Gold Coast Airport car hire. Great cars at car rental gold coast airport are available to choose from at its best value.